(16.07.2016) On 15 July 2016, there was an attempt to stage coup d’état in Turkey. There is still danger of coup d’état. Many civilians, soldiers and police officers either lost their lives or were injured resulted from violence, clashes during this attempt. Since military vehicles, fighter jets were active in city centres particularly in civilian settlements, neighbourhoods, and clashes took place in these areas lead to serious concerns and fear among citizens. On the other hand, we also observed that there are some cases that some citizens showed reactions beyond democratic principles, and some lynches attempts. In short, Turkey is heading towards a fast and deep chaos of which extent is unknown. 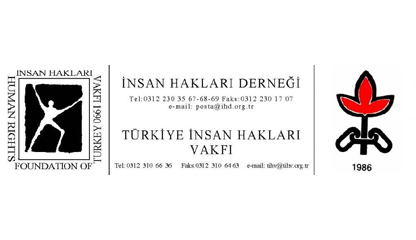 We, as Human Rights Association (İHD) and Human Rights Foundation of Turkey (HRFT), would like to underline that we defend democracy and human rights principles under any condition and at any time. This is our fundamental position and we have been defending this position since we established our organisations. We condemn any kind of coup d’état and attempt to stage coup d’état, which mean complete denial of democracy and fundamental rights, freedom, and violence and lynches that remind civil war scenes. We offer our condolences to victims’ families and wish a speedy recovery for injured people. This chaos is directly related to a fact that Turkey has not been able to solve its democracy and human rights problems. The Government has not implemented democratic principles such as plurality, transparency and participatory, but harmed fundamental rights and freedoms as well as rule of law, passed anti-democratic laws such as impunity law for soldiers-which reinforces military tutelage-, adopted policies based on violence rather than solving the Kurdish question through democratic and peaceful means, and conducting war at home as and in other countries. All these problems lead to a deep political and state crisis in Turkey. Unfortunately, there are some statements on bringing death penalty back to Turkey lead to serious concerns about possibilities of our future. The only way to exit from this chaos is to obey and respect for rule of law, democracy and human rights, and to adopt peaceful policies at home as well as in other countries. Democratic forces in Turkey will continue struggle for genuine democracy and against military or coup d’état regimes, anti-democratic practices, and increasing civilian authoritarian administrations. IHD and HRFT would like to repeat that we will main our human rights activities to determine and document human rights violations, to actively provide legal and medical assistance. No to coup d’état and anti-democratic administrations! Democracy and human rights are most important issues!